Better Technology, Better Results, Better Vision! The San Diego LASIK Institute is proud to offer San Diego fifth generation iLASIK surgery. We combine the state of the art Intralase LASIK laser called the iFS and the Advanced Custom Wavefront technology of the Visx Star S4 laser to provide our San Diego patients with the pinnacle of laser vision correction technology. There are only a handful of iFS lasers throughout the world. The iFS laser makes the flap in your LASIK surgery in less than ten seconds. It is 250% faster than other Intralase lasers used in San Diego and throughout the country. This increased speed leads to more comfort and safety for your LASIK procedure. iDesign LASIK involves three lasers - the iDesign advanced custom wavescan, the iFS fifth generation (bladeless) laser, and the VISX Star S4 with Iris Registration. The iFS Intralase laser runs at a speed of 150kHz. This is 250% faster than the speed of other Intralase lasers in San Diego. The remarkable speed of the iFS Intralase laser allows us to make your LASIK flap in as little as 10 seconds! The most uncomfortable part of your San Diego LASIK procedure is making the flap. With a faster speed, the discomfort most of our patients feel is very minimal. 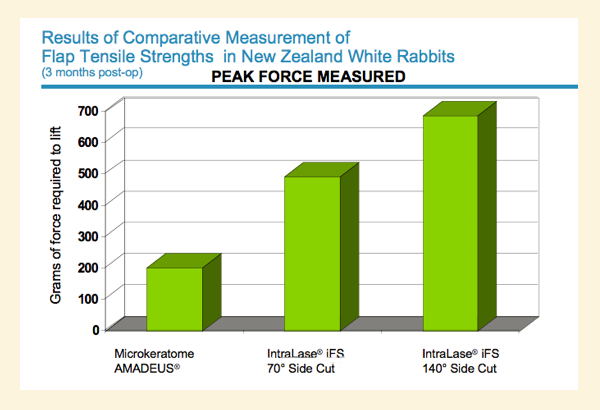 Table Comparing the Strengths of Flaps made with Microkeratome and the iFS Intralase laser. Intralase iFS made flaps are over 300% stronger! I have seen many advertisements for "All Laser" or "Bladeless" LASIK, is this the same as the iFS laser? Not all "bladeless" LASIK is the same. Although Intralase was the first all laser treatment, the iFS is the fifth generation of the Intralase laser. The San Diego LASIK Institute is the first one to have it in San Diego. Please be sure to ask for the iFS laser by name. The previous version of the Intralase was called the FS laser so it is easy to get confused by the similar name. Also, you can ask for the speed of the laser as well to make sure that it is the iFS laser which runs at 150 kHz. The iFS laser has unprecedented speed and safety. Is the iFS Laser more expensive? At the San Diego LASIK Institute, we are committed to using the best and safest LASIK technology today. We believe that good vision is priceless and we have committed to using the best technology even if it costs us more to do it. We will never let cost concerns dictate the quality of our care. Although the iFS laser is the most advanced and costly femtosecond laser for us to acquire, we have not increased any of our prices. Is this the same as customized LASIK? The iFS laser is the first step of your iLASIK procedure. It makes the corneal flap which allows our San Diego LASIK Surgeon to continue with the second laser which does a customized LASIK procedure. We have now customized every part of the LASIK flap. The iFS allows us to customize your LASIK flap in ways previous lasers could not. We make a customized diagnosis, a customized flap, and a customized treatment. Is microkeratome or razor blade unsafe? No, we feel the iFS reduces the risks of traditional LASIK and we are committed in using the safest technology. The iFS has flaps that can be up to four times stronger than flaps made with the razor blade. Besides the safety of the flap making process, the iFS laser can make customized flaps in terms of size and flap thickness. It can also make inverted bevel side-cut LASIK flaps which are impossible to make with a mechanical blade. 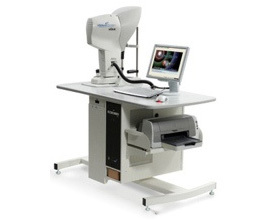 CustomVue Technology - The Visx laser uses wavefront technology to capture an individualized map of your eye. This map measures the micro imperfections that LASIK surgeons call higher order aberrations and treats them. Over 94% of patients in the FDA clinical trials are approved for custom wavefront LASIK with the Visx Star S4 laser. The wavescan uses a specialized device called a Hartman-Shack aberommeter to measure over 240 individual points in your eye. In this example below, you can see three patients with the same prescription. With non custom LASIK, each of these patients would have received the same LASIK laser treatment. 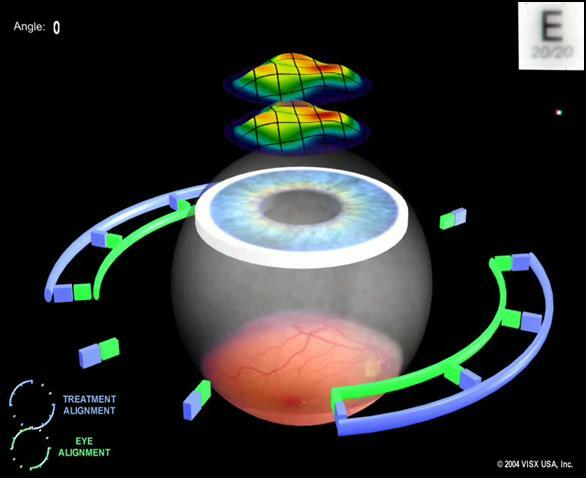 However, with custom technology these patients have completely different wavefront maps and would receive a unique LASIK treatment. Iris Registration is designed to compensate for your eyes rotation (torsion) when you lay flat. It uses advanced intrared technology and computer technology to compensate if your eyes are rotated. It is the only FDA approved method that accomplishes this goal. For surgeons using other laser systems, they have to mark your eye with a pen to make sure that your treatment is aligned. The Iris Registration technology greatly increases the safey and accuracy of you iLASIK procedure. iDesign Advanced Custom LASIK - Making the Best CustomVue Technology Better! Easy for Patients: The iDesign Can take up to 5 scans in three seconds. It measures wavefront aberrometry, wavefront refraction, corneal topography, keratometry, and pupillometry. This makes your consultation easier. Treat Larger Prescriptions: The FDA has allowed the use in patients as young as 18 and treats more than 25% more astigmatism. Quality Outcomes: The initial studies have shown that the majority of patients are satisfied with their quality of vision. Knorz MC, Vossmerbaeumer U. Comparison of flap adhesion strength using the AMADEUS microkeratome and the IntraLase iFS femtosecond laser in rabbits. J Refract Surg . 2008;24(9):875-878. Probst L, Lehr J. Changes in visual acuity and results and testing after LASIK. Paper presented at: American Society of Cataract and Refractive Surgery; March 2011; San Diego, CA. Tanna M, Schallhorn SC, Hettinger KA. Femtosecond laser versus mechanical microkeratome: a retrospective comparison of visual outcomes at 3 months. J Refract Surg . 2009;25(7 Suppl):S668-S671. Binder PS. AMO’s new iFS advanced femtosecond laser: faster, safer, more versatile. Refractive Eyecare . 2008. Donnenfeld E. Preservation of corneal innervation with femtosecond laser inverted sidecut flaps. Invest Ophthalmol Vis Sci . 2010 51: E-Abstract 2855. Santhiago MR, Wilson SE. Cellular effects after laser in situ keratomileusis flap formation with femtosecond lasers: a review. Cornea . 2012;31(2):198-205. Binder PS. One thousand consecutive IntraLase laser in-situ keratomileusis flaps. J Cataract Refract Surg . 2006;32(6):962-969. Stonecipher K, Ignacio TS, Stonecipher M. Advances in refractive surgery: microkeratome and femtosecond laser flap creation in relation to safety, efficacy, predictability, and biomechanical stability. Curr Opin Ophthalmol . 2006;17(4):368-372. Kezirian GM, Stonecipher KG. Comparison of the IntraLase femtosecond laser and mechanical keratomes for laser in-situ keratomileusis. J Cataract Refract Surg . 2004;30(4):804-811. Binder PS, Gray B, Brownell M, et al. Morphology of femtosecond intrastromal arcuate incisions. 2012.03.07-ME4839. Meltendorf C, Burbach GJ, Ohrloff C, et al. Intrastromal keratotomy with femtosecond laser avoids profibrotic TGF-ß1 induction. Invest Ophthalmol Vis Sci . 2009;50(8):3688-3695. Rashid ER, Waring GO 3rd. Complications of radial and transverse keratotomy. Surv Ophthalmol . 1989;34(2):73-106. Steinert RF. Using IntraLase to improve penetrating keratoplasty. Refractive Eyecare . Feb 2007. Price FW Jr, Price MO, Grandin JC, et al. Deep anterior lamellar keratoplasty with femtosecond-laser zigzag incisions. J Cataract Refract Surg . 2009;35(5):804-808. Greenberg K. WaveScan WaveFront system key to individualized LASIK treatment. Refractive Eyecare . April 2010. Dai GM, Gross E, Liang J. System performance evaluation of refractive surgical lasers: a mathematical approach. Appl Opt . 2006;45(9):2124-2134. Data on file. AMO Development, LLC. CustomVue Procedure clinical trials submitted to the FDA; 2003, 2004, 2005 & 2007.